I always enjoy aerial photos. Thanks! Did you know that when you click on the image at Vintage Portland, it doesn’t automatically enlarge? At least it hasn’t on my computer. I found where to click to make it do that, on the file of the image page or whatever you call it. So, I’m curious. As a rule, will we be seeing the enlarge photos in this manner? Just curious, not complaining. Thanks! I just saw the date of the images-Dec. 31, 1947. I was 19 days old, down in Jackson, Mississippi! And I got married on that day 28 years later. Plus, I just walked along the east sidewalk on Interstate in the photo, like I’ve done now and then since I moved to Portland in 2006. I believe I even see the Widmer Gasthaus where I’ve enjoyed friends and food several times. Thanks again for this fine photo, y’all. I noticed that too, Lynette. When you click on the picture, instead of getting the enlarged image, you get “efiles”, then you can click on that and get the enlarged image. I wonder, if since there is already a link to “efiles” below the picture, we could get just click on the image in Vintage Portland and go directly to the enlarged image? I understand there will be formatting differences from how Dan managed it. I like how they’re doing so far though! It looks like they stopped construction on those ships when the war ended and two years later still don’t know what to do with them. Thank you for drawing our attention to the photo enlargement issue. The matter has been addressed. It should now enlarge when you click on the image, and take you to the link in Efiles when you click on the text below. Thank you for all your patience during this transitional phase! I see the Widmer building at Interstate and Russell in this aerial.. I remember it as a tavern with a barred check cashing window for employees from UP RR Albina yards across Interstate. Wonder if the concrete trough at the foot of the bar remains, quite a convenience in its day. I once worked for Peerless Pacific, the curved building in the center of the photo. This photo brings back memories for me. In the early 70’s I worked for Willamette Elec. in their billing department They rebuilt generators, starters, magnetos, etc. for cars and trucks and planes that were sold in all the major parts houses into Idaho, Utah, Wash.and northern Calif. I found the White Eagle Saloon on the south side of Mississippi and Russell. The plant where Willamette was built is on the empty lot just to the north. The building across Mississippi to the west that you see a cut out area to the roof is apartments. Portland Maps informs that those apartments sold for $2,350,000.00 in Sept. of 2013. Willamette was previously on SE Stark not far from Grand Central Market. I was told property was very cheap after the riot in Albina in 66′ or 67′ (?). They moved there after the riot. My greatest memory was sharing lunch with 2 lady’s who were “Rosie the Riveters” during WW2. They worked the ship yards just a short ways down the street. What story’s they had to share. Enjoyed this photo so much! This photo is a pretty good illustration of incongruent street grids created by individuals platting their own adjacent donation land claims. Heading North, you have to jog east or west to stay on the same street once you cross Russell. Portland is full of these incongruities. This is one of the more extreme examples. The reason the downtown street grid takes a turn to the North is the result of land owners South of Ankeny (particularly Benjamin Stark, Daniel Lownsdale, William Chapman and Stephen Coffin), platting their land claims oriented to the river, while Captain Couch platted his claim with the streets oriented due North South. Great photo! I hadn’t realized there was a shipyard along that stretch of the river. 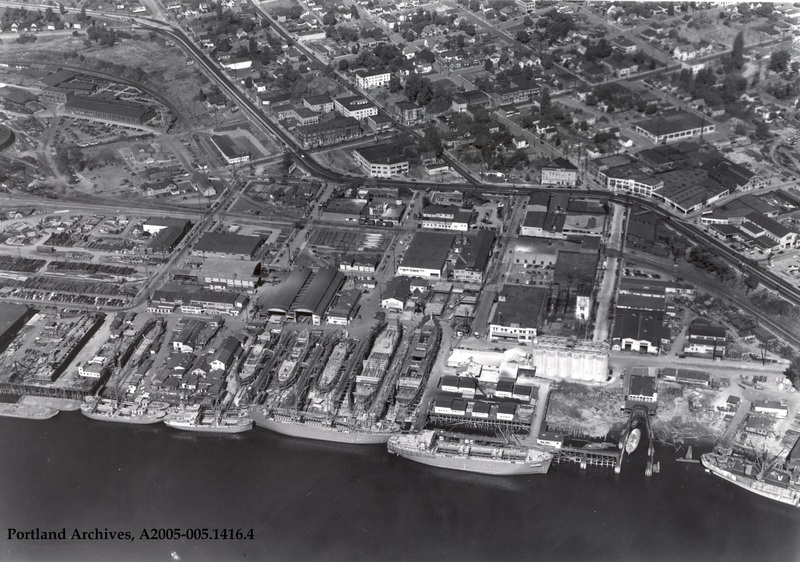 A bit of research shows that was the old Albina Shipyard. Sadly, this part of the river is a highly contaminated Superfund site. This is a good view of the last single family home still standing in the whole area. The lone wolf is on the NE corner of N Albina and Knott. I’d love to see the next area north (on Albina) of this photo, and the next area south (on Interstate). This area has been transformed since the late sixties and early 70’s, but every time I drive thru it (almost daily) I try to see it as it may have been: Easier with these great photos! It almost looks as if the interstate veered off into the direction of present-day Greeley. If it didn’t, what is currently Interstate Avenue going up what I call the “Kaiser hill” looks rather quaint to be an interstate. But how could that be, with all of the old hotels along Interstate further north? The larger ships at Albina Engine works are a type C1 freighter. Albina built four of these. Arizona Pine, Calfirnia Redwood, Oregon Fir and Washington Cedar. All were started in 1945, and werent delivered till 47. I’d say this pic is in the late summer of 45. All the trees are leafed out and there seems to be not much work on the ships.